If your 2015-2019 F150 is destined for aggressive off-road adventures, then Bilstein has your back with their B8 6112 Front Coilover Assemblies. These powerful suspension upgrades give your F150 awesome off-road capability and can soak up violent impacts from rough terrain, all while maintaining good street ride quality. The Bilstein 6112 coilovers feature a large-diameter shock body and specially-designed coilover spring that both work together to give your F150 a huge improvement in handling and off-road performance all without breaking your bank. The 6112 coilover assemblies even feature adjustable ride height settings using snap ring system, allowing you to set your truck at 0", .5", 1", 1.5", or 2" of front ride height to help you clear larger wheel and tire combinations while reducing your factory rake. The 6112 front suspension kit is a great choice for a truck destined for off-road applications on a budget. The Bilstein 6112 Front Coilover Assemblies feature a durable construction with a piston and valving designed to handle aggressive applications. 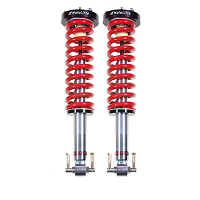 The coilovers are built around a 60mm diameter (2.36") shock body that has a much larger oil capacity than stock and features a zinc plated finish to help prevent corrosion. The shock assembly utilizes a gas-charged monotube internal design with a digressive piston with valving tuned specifically for your truck. The coilover assembly comes with a new Bilstein spring and billet spring seats that use a snap ring to fit into grooves on the shock body for ride height adjustments. The assembly reuses the factory upper coilover mount, bump stop, and hardware. 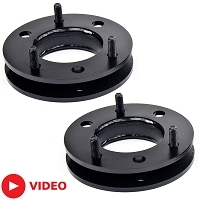 The B8 6112 kit comes with installation and ride height adjustment instructions. RWD/2WD F150s Only: this version of the Bilstein 6112 Kit only fits 2015-2019 F150s with RWD/2WD. A version for 4WD F150s is also available. Pending Stock - Available Late May Free Shipping!